Date: 23 November 2017: This is Issue 10 of IADAB News Weekly where we summarise the most important news of the week in the fast developing Anaerobic Digestion and Biogas Industry. This week we have news from the US, Italy, and the UK. In one way or another all are seeking to get better biogas yields and more out of their involvement in the anaerobic digestion process. The first two articles highlight the many and varied ways in which US academia is following on from that in Europe and many other nations, and discovering many new largely un-researched topics, in anaerobic digestion and biogas, which they are now exploring. This enables them to work with AD Plant operators to improve yields and reliability, providing educational opportunities for their students, and a service both to their own biogas installations and outside to their local communities. Also in the case of Michigan University they are conducting research in partnership with the University of Costa Rica, which involves evaluating operating at higher temperatures to produce pathogen-free residue. An interesting possibility here would arise if they were successful. That would mean that digesters could then be operated without the need for additional expensive energy-consuming pasteurising equipment. In the final paragraph of the Michigan University article extract we are told that assisting the Detroit Zoo, which is now in the early stages of developing a dry digester using food and animal waste, which conveniently leads us into the penultimate article of the week. That article informs us that HZI is to build Italy’s fifth Kompogas Dry Anaerobic Digestion Plant. Biowaste and green waste will be processed using dry anaerobic digestion and composting. The biogas produced will be upgraded to valuable biomethane, and the digestate will provide nutrient-rich liquid fertiliser and high-grade compost for use in agriculture. Last, but not least, our final UK article explains in a frank manner why so much university research is being done on anaerobic digestion globally, in an article titled: "Getting More Out of Anaerobic Digestion". That reason is the reality of poor performance, especially from many UK food waste AD plants. The author refers to many instances where plants are failing to achieve standards which would be routine within more mature industries. Some of the barriers which are suggested as preventing better digester performance, are multiple and variable quality feedstocks, over-feeding digesters, and rapid changes in feed material quality. Nevertheless, the author points to rapidly improving average UK wide load-factors, so the solution to low biogas outputs, does appear to be on the horizon for the UK food waste anaerobic digestion industry. A college in Vermont, US, is aiming to reduce its carbon footprint by producing renewable natural gas from food waste and manure. Middlebury College has entered into a partnership with Goodrich Family Farm in Salisbury, Vermont, Vanguard Renewables of Wellesley, Massachusetts and Vermont Gas. The new agreement will see Vanguard Renewables construct, own and operate a facility at Goodrich Family Farm which combines cow manure and food waste to produce renewable natural gas. Gas produced in the anaerobic digester will be transported by a four mile pipeline to Middlebury College’s main power plant. The college has agreed to buy most of the new facility’s output. said Chase Goodrich, who is among the fourth generation of his family to operate the farm. Currently in the permitting phase, when completed the anaerobic digester facility will produce the largest amount of renewable natural gas of any facility in Vermont. It will process 100 US tons of manure from the farm and 165 tons of organic food waste per day. Anaerobic digestion facilities are popping up across the country, including some at college campuses. Michigan State University, in East Lansing, Mich., is leading the way with a facility that processes between 20,000 and 24,000 tons of food waste annually to generate 380 kilowatts of electricity every hour for the campus, up to 2,800,000 kwH annually. But Michigan State’s influence stretches far beyond its campus where ongoing research in Costa Rica and other South American countries is exploring methods to address challenging waste streams specific to certain regions. Michigan State’s earliest involvement with AD reaches back to 2003 when it secured a grant to build a full-scale plant on a local dairy farm. In 2008 it created an AD research education center, which is a private- public partnership to support the developing industry. The focus is on helping municipalities, other waste generators, and investors to understand how the technology can be used for renewable energy and waste management. In addition to providing [an AD research education center for] their stakeholders with training and technical assistance, the university’s researchers evaluate feedstocks. They have looked at more than 1,000 waste products from paper plates to grass cuttings to determine biogas potential. Its work internationally is driven largely by the goal to learn more. Research in partnership with the University of Costa Rica involves evaluating operating at higher temperatures to produce pathogen-free residue. Facilities are using fruits and vegetables from distribution centers and have used coffee wastes as feedstock. Currently the work is focused on transforming pineapple liquid waste to energy. While research involving Michigan State was concentrated in Costa Rica, Nicaragua and Panama were also involved. As it continues its work overseas and on campus, Michigan State is looking for more ways to advance the technology and with new feedstocks. Swiss waste to energy firm, Hitachi Zosen Inova is to build a new Kompogas plant in collaboration with its Italian partner Cesaro Mac Import in Foligno, a town in the province of Perugia. The firm said that the plant will process some 40,000 tpa of biowaste and 13500 tpa of green waste, producing enough high-quality biomethane to provide energy for up to 2400 households or more than 500 natural gas-driven vehicles. The plant is scheduled for completion at the end of 2018. Along with the composting technology by Cesaro Mac Import (CMI), the dry anaerobic digestion (AD) technology provided by Hitachi Zosen Inova (HZI) will form the core of an overall concept aimed at processing and profitably recycling local organic waste. HZI said that the regional biowaste (SSO or ‘FORSU’) and green waste will be processed using dry anaerobic digestion and composting to deliver the best possible yields. Over the last 10 years, anaerobic digestion (AD) has taken the UK by storm. There are now enough AD plants in the UK to power over a million homes but, even as technology and know-how improve, many are not fulfilling their potential. Failing to deliver on gas results in reduced income and missed targets – in effect, the plant operates as an expensive waste management solution rather than an effective renewable energy business. So why has this situation arisen, and what can operators do to improve performance? ...Today, many food manufacturers and local authorities specify AD for residual food waste, but show little interest in how effective plants are. The best measure for performance is load factor, or running time. Recent years have witnessed phenomenal improvements – even six years ago, average load factors sat at just 46 per cent, compared with 73 per cent in 2016. However, with the most efficient operators reporting levels of 98 per cent, many in the industry still have a long way to go. The biggest barrier is feedstock. Despite murmurs from central government on separate food waste collections for all households in England – in line with Wales and Scotland – collections currently lie at just over 50 per cent. Similarly, the bulk of commercial food waste collected does not make it to AD either. On the ground, improved feeding regimes have a direct impact on gas produced. AD is all about maintaining good biology, and good biology relies on consistency. Recent changes to renewables incentives mean that agricultural plants coming onto the market will need to include a fraction of food waste in their ration. Please Like, subscribe and leave a comment. Also - Join our mailing list! 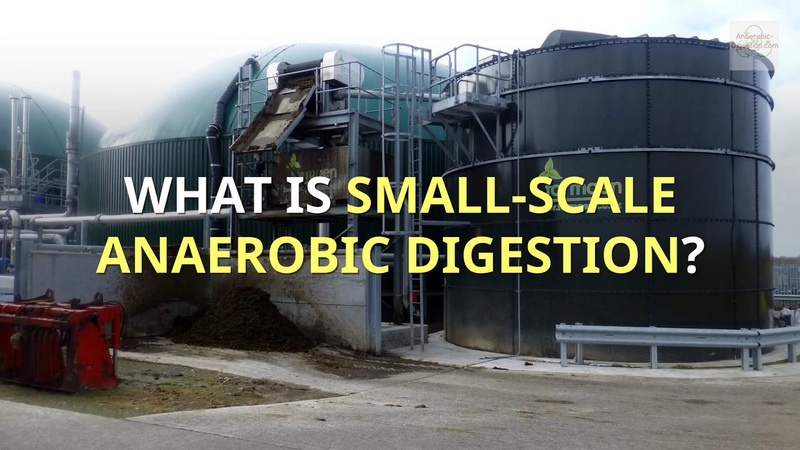 WHAT IS SMALL-SCALE ANAEROBIC DIGESTION ? Small-scale or "pocket" digestion is a technology where the anaerobic digestion process is applied to proprietary biomass flows for the on-site production of renewable energy. This energy is made available in the form of electricity and heat after combustion of the biogas in a combined heat and power (CHP) installation and is used to a maximum on-site. Although there is no internationally accepted legal definition for pocket digestion, there is a consensus that the term “pocket digestion” is applicable to installations with a proprietary biomass supply that produce energy in function of the proprietary energy demand. “Mono-digestion” is applicable for installations that use only one type of biomass input. The smallest installations are also called micro digesters. The popularity of pocket digestion has increased greatly in the last few years in the Flemish region of Belgium and a number of neighbouring countries. In Flanders there are about 80 active pocket installations to this date and it is expected that this number will increase significantly over the next years. This video is based upon the definition provided by the University of Gent, Faculty of Bioscience Engineering in their pdf document, titled "Small-Scale Anaerobic Digestion Case studies in Western Europe". 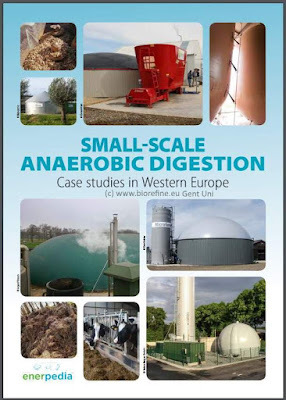 For more information on this informative download visit: https://anaerobic-digestion.com/ssad or click the link below. This video is available for wtaching and embedding at the YouTube website location here. Date: 17 November 2017: This is Issue 9 of IADAB News Weekly where we summarise the most important news of the week in the fast developing Anaerobic Digestion and Biogas Industry, both in the UK and globally. This is a special biomethane edition. Biomethane production from biogas is important. Biomethane is made by purification of the raw biogas, gives it virtually the same market for it's creators to sell it in, as natural gas. Doing this means that instead of about 30% of the energy being lost in the electricity grid by the time it gets to the user, all of it can be used to fuel say a transport vehicle. This seen as a very sustainable way to improve the effectiveness of anaerobic digestion derived energy. 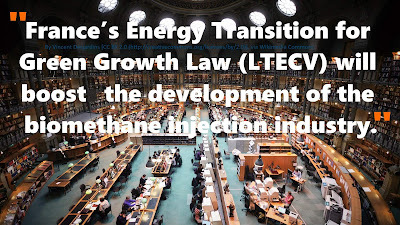 The first is an extract from part of a fact-filled overview of biomethane injection in Europe from a French perspective, which explains how France’s Energy Transition for Green Growth Law (LTECV) is expected to boost the development of their biomethane injection industry. Second of our article extracts provides more evidence of the extent, globally that the biomethane market is expected to experience a hike in growth by 2025. This will hardly be news to our readers, after reading about the French LTECV, but it serves to reinforce the view that big opportunities are ahead for growth in biomethane production. Most notably this will be in a big increase in the injection of biomethane into local gas grids, and the use of biomethane to replace diesel in fleets of vehicles. But, this growth will only be reliably be supported by the public, as long as the claimed "green" benefits of biogas match reality, and the industry will need to show transparency about their output volumes, and demonstrate that their AD plants stand up to independent auditing of their "green" gas production rates. That's why we include our third news snippet, which features UK Biomethane Certification for UK AD Plants. In fact, it is happening already. The UK Biomethane Certification of UK AD Plants (GGCS ), now tops the impressive "1 TerraWatt hour" mark. The GGCS is said to be a reliable means of ensuring that there is no double-counting or double-selling of green gas. Finally, we have included a snippet from a case study, in the form of the plans of a Swiss company, "Salt" (a Telecoms Provider) to become "a green and sustainable business", with its new car fleet which will be powered by CNG / Biomethane. This extract shows that businesses are taking up the opportunity to use biomethane, and investing the necessary money now to buy CNG fuelled vehicles. Biogas production is part of the renewable energy development strategy in France since 2011. 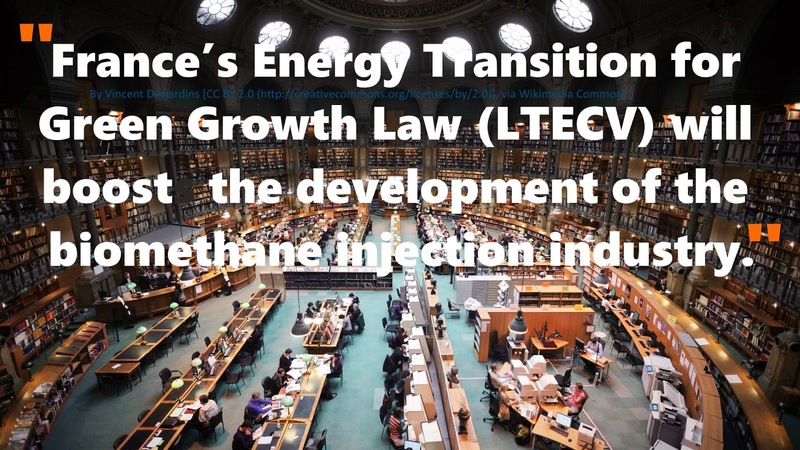 The France’s Energy Transition for Green Growth Law (LTECV) boosts the development of the biomethane injection industry. In 2016, 40 400 tonnes of greenhouse gases were avoided thanks to biomethane. According to an analysis by GRDF and ADEME, the development of the biomethane sector would avoid 750 000 tonnes of CO2 by 2020. In France, the biomethane sector is currently booming. In 2016, 215 GWh were injected into the gas network – an annual increase of 162%. France has 548 biogas production units, 26 of which inject biomethane into the natural gas network. However, renewable natural gas represents only 0,05% of the French consumption, while the Energy Transition for Green Growth Law sets at 10% the consumption of renewable natural gas by 2030. The frontrunners in the global biomethane gas market, according to one of the reports by Transparency Market Research, are CNG Services Ltd., Planet Biogas Global GmbH, SGN, Future Biogas Ltd., VERBIO, Magne Gas, Gasrec, Gazasia Ltd., Biogas Products Ltd., Schmack Carbotech GmbH, EnviTec Biogas AG, SoCalGas, ETW Energietechnik GmbH, ORBITAL, and JV Energen. As per estimates of a report by Transparency Market Research, the global biomethane market stood at a valuation of US$1,485.4 mn in 2016 and is expected to reach a valuation of US$2,624.5 mn by 2025 rising at a CAGR of 6.7% between 2017 and 2025. The segments of the global biomethane market based upon application are automotive sector and power generation. The automotive sector is expected to account for a significant share in the market over the forecast period. The key regional segments into which the global market for biomethane is divided in this report are North America, Europe, Latin America, Asia Pacific, and the Middle East and Africa. In 2016, North America and Europe held a significant share of the global biomethane market. The trend is expected to continue over the forecast period as well. One of the key growth drivers of the global biomethane market is the green gas characteristic of biomethane. Biomethane is produced by the natural breakdown of organic material, which includes green waste, agricultural waste, food industry waste, household waste, and even industrial waste. The process of production of biomethane involves breaking down of organic matter in an anaerobic environment to produce biogas, which is further purified to produce biomethane. The GGCS provides an objective means of tracking the commercial transactions of biomethane ( or ‘green gas’) through the supply chain. It tracks the green gas from its injection into the gas distribution network and its sale to a supplier or trader, through to when it is sold on to an end-use consumer. It is important to note that the GGCS tracks the contractual flows of green gas rather than the physical flows of green gas. Since each unit of green gas injected into the network displaces the need for a unit of conventional, or natural gas, the contracts are the only practical means of tracking the green gas from production to end use. In this way, the GGCS is a reliable means of ensuring that there is no double-counting or double-selling of green gas. It eliminates from the green gas market the sorts of misleading claims that have characterised the ‘green’ electricity market for the past ten years. The GGCS thereby promotes confidence in the wider energy sector and encourages green gas producers to inject their gas into the gas distribution network as an alternative to using it generate electricity. Over the next 6 months, Salt will renew a large part of its corporate fleet by choosing a Seat car, the Leon 1.4 TGI EcoFuel, powered by petrol and natural gas / biomethane. The first Swiss telecom operator to do so, Salt placed an order with its fleet management partner in October. The combination of two separate fuel tanks makes it easy to switch between one type of fuel and the other, the range of the natural gas / biomethane tank is 400 km and that of petrol is 900 km. Image: A photo of the Leon 1.4 TGI EcoFuel car, powered by petrol and natural gas / biomethane. From now on, it will make up the majority of vehicles in Salt's new car fleet. Salt's goal is to use natural gas / biomethane on at least 80% of the kilometers traveled. This will allow Salt to reduce its CO2 emissions by up to 40% compared to an equivalent fleet of vehicles fueled exclusively by petrol. Natural gas / biomethane is available in more than 140 service stations throughout Switzerland. In general, it is a mix of 80% natural gas and 20% biomethane produced from Swiss organic waste. Like, subscribe and leave a comment. Join our mailing list. 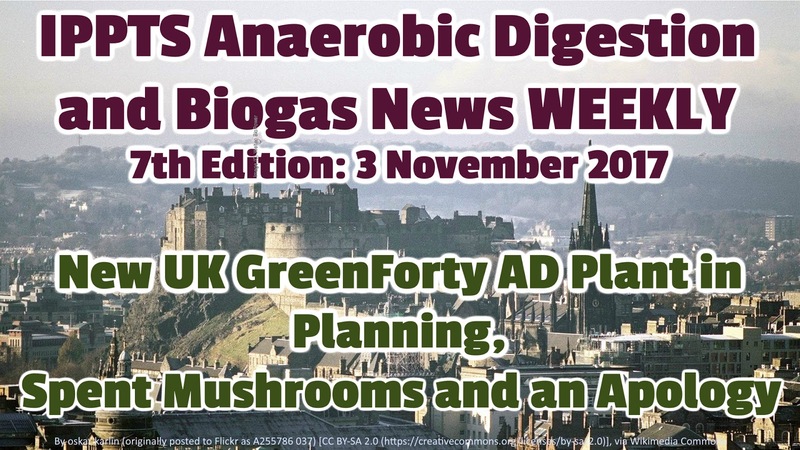 Date: 10 November 2017: This is Issue 8 of IADAB News Weekly where we summarise the most important news of the week in the fast developing Anaerobic Digestion and Biogas Industry, both in the UK and globally. 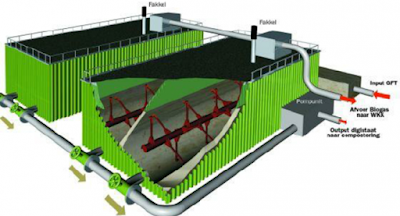 In this edition of the most trending anaerobic digestion and biogas news, we bring you an update on the number Biogas Plants in Germany and total energy output, we include an article about a Home Biogas Product, and explain why UK's Severn Trent is investing in biogas plant upgrades. The Biogas industry in Germany is saving 20 million tonnes of CO2 emissions annually, and 205 new biogas plants were connected to the grid in 2016, more than the 150 expected by the association. The combination of new plants and expansions to existing plants mean Germany’s biogas industry is now generating an additional 219MW a year. Nevertheless, as a nation Germany needs to do better because the government is currently not achieving its 2020 self-imposed climate goals. 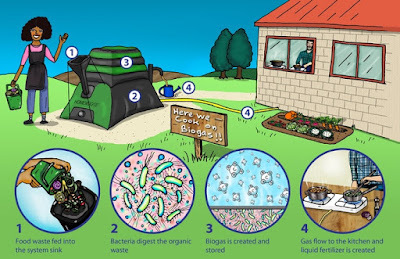 We include news of the HomeBiogas 2.0 product from an Isreali start-up business which has been successful already in developing the first version of this product, using crowd-funding. Now they are seeking funding for the start of production of their second product which they say will produce better biogas production results, at very much reduced cost. The new anaerobic digestion system is claimed to produce 3 hours of cooking gas per day from Kitchen Scraps, thus passing an important milestone for self-sufficiency in family cooking fuel requirements. We do not know enough about this product to recommend it or not. We welcome comments from any readers who have bought and used the initial Mark 1 - HomeBiogas digester system. 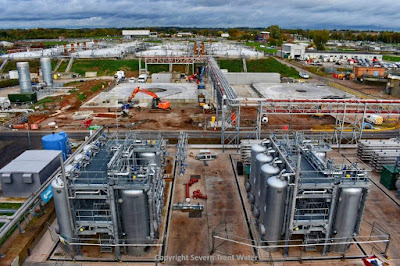 Finally, the news that Severn Trent is investing £60m in biogas upgrade equipment which raises the biogas output (yield) from their existing anaerobic digestion plants by about one third from the same sludge feedstock, is welcome news. If it makes financial sense, and we have no doubt ST has done their calculations correctly on that, we can expect many more water utility companies to follow by adding hydrolysis units to their biogas plants. Biogas plants in Germany are saving 20 million tonnes of CO2 emissions a year, according to the president of the German Biogas Association. Recently released figures from the German Biogas Association show that 205 new biogas plants were connected to the grid in 2016, more than the 150 expected by the association. The figures also show that 10 biogas plants were decommissioned. In total, the new plants have an output of 45 megawatts (MW), with 37 MW being used to generate electricity. "All in all, the growth in the new plants is still very low compared to previous years, but many operators are investing more in the flexibility of their plants. This investment and the export business allow the plant builders to survive,"
explained Horst Seide, president of the German Biogas Association. Increased investment in small liquid manure plants will likely continue the increase in plant numbers, according to the association. The biogas figures come in the wake of Germany’s Federal Environment Ministry showing that the government missed its 2020 self-imposed climate goals. Figures from the German Biogas Association reveal that in total plants installed 175MW in additional capacity in 2016. One Israeli company has developed the next generation of what it believes to be a simple and effective device for turning kitchen scraps into fuel and fertilizer, thereby tackling both food waste and clean cooking in one fell swoop. HomeBiogas, which successfully launched its first home biodigester system on Indiegogo in early 2016, has been working to improve the design of its product into a more durable, lower cost, and more efficient model, and recently unveiled the next iteration of this backyard biogas device. 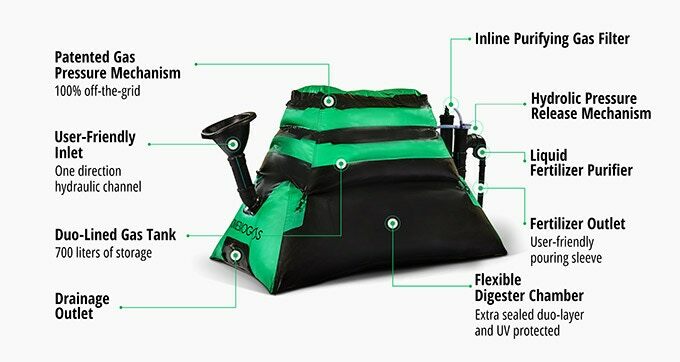 While its first product offering was priced right around $1000, the new version, HomeBiogas 2.0, is selling for less than half of that, and is claimed to work at twice its original speed. 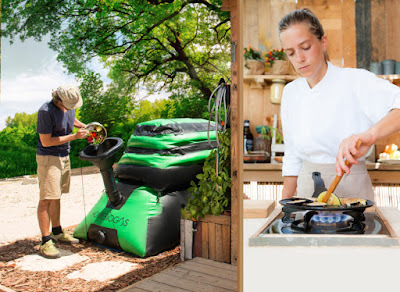 The biogas appliance is meant to sit in the yard near the kitchen (up to 20 meters away), where the 1200-litre tank is filled with water, “activated” with bacteria, and then filled with food scraps, kitchen and garden waste, or animal manure on a daily basis. Inside the digester tank, bacteria breaks down the organic matter, producing biogas that gets collected in a 700-litre gas storage tank, which then feeds the biogas to the stove in the kitchen. It is a completely off-grid appliance, and as long as it is fed properly and within the optimal temperature range, it is claimed to produce up to 3 hours worth of cooking gas daily. When outside temperatures are above or below the recommended range, the appliance requires shade, insulation, or a heater to perform as designed. In addition to biogas for cooking, the HomeBiogas 2.0 system also produces up to 12 litres of organic liquid fertiliser each day, which can go a long way toward boosting garden yields and increasing soil health and fertility. According to the press materials, although the HomeBiogas 2.0 system gradually fills its gas storage tank as the biogas is produced, a “patented mechanical pressure mechanism” and an inline gas purifier ensure that clean, ready-to-use cooking gas is delivered at a uniform rate to the biogas stove. Backers of the Kickstarter campaign at the $475 level will receive a HomeBiogas 2.0 appliance and a specially adapted biogas stove burner when they ship in the spring of 2018. And for those who want to buy in at an even lower rate in order to resell the units, a pallet of 10 units is available to pledges at the $3,600 level. While this home biogas appliance looks to be an effective way for homeowners (and renters) to convert organic waste into a clean and off-grid cooking fuel, it’s the possibilities for it to alleviate deforestation, dirty cooking fires, and air pollution in the developing world that could have a large impact. 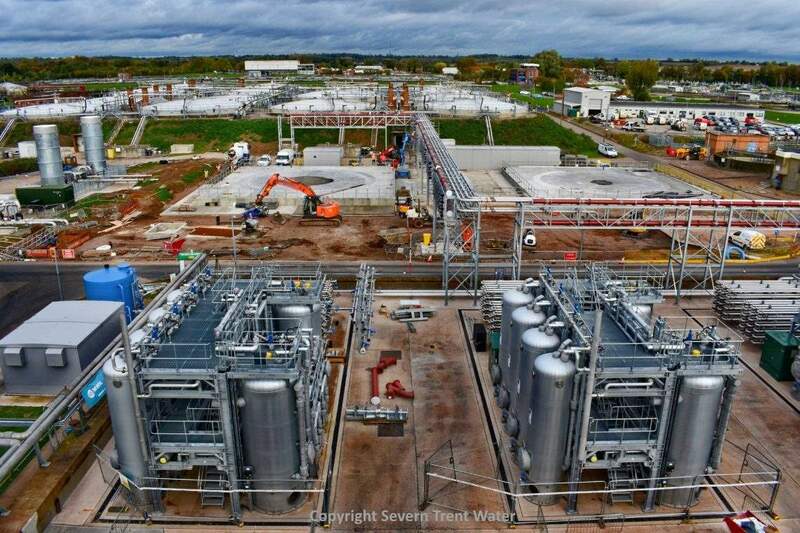 Severn Trent has invested £60 million in a thermal hydrolysis plant (THP) to make the process of generating clean energy at one of its sites more efficient. The water company says the technology will see the electricity produced at Minworth Sewage Treatment Works increase by almost a third. The process works by treating sewage sludge, using heat and pressure to sterilise and shatter the cell structure of the bacteria within. The treated sludge then undergoes a biodegrading process to turn its solid matter into methane-rich biogas. The remainder can then be recycled and used as a fertiliser for agricultural land. By generating renewable energy in this way, Severn Trent says it has been able to reduce costs, helping it keep customer bills down. It expects the THP installation to be fully operational by 2018. David Nyul, Project Manager for Severn Trent, said: “Generating clean energy through anaerobic digestion is a real priority for us and we’ve been treating sewage in this way for the last 60 years. Is it too soon to say that on the home biogas plant front, there will soon be a solution which becomes the new standard in low-cost home biogas units? If so, there could be MASSIVE global sales. Comments are welcome! 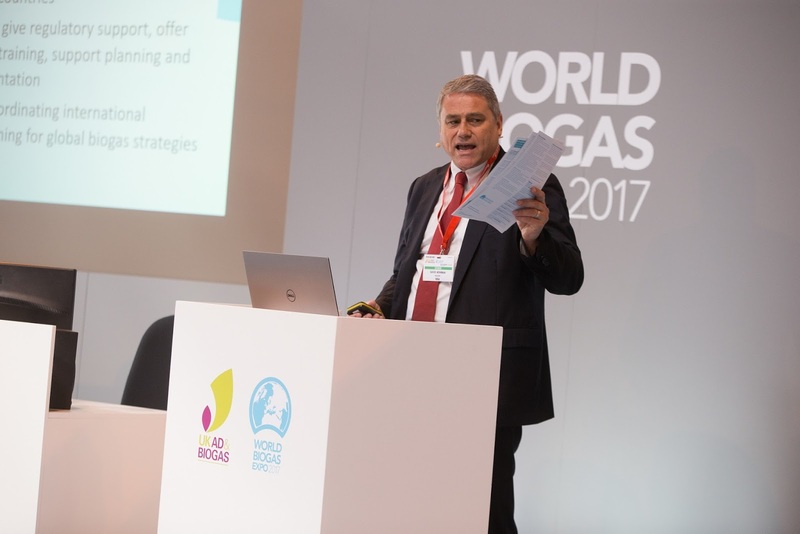 The new UK based voice which promotes the global benefits of Biogas Technology, The World Biogas Association (WBA), is celebrating its first birthday at the COP23 climate change conference later this week. The press release below explains the very active first year of this new organisation. It's efforts are very much to be applauded, and if possible are even more important than when the organisation was formed a year ago. the recent news of alarming rises in carbon dioxide levels in the global atmosphere recently. We hope that you will scroll on down this age and read more, because it has never been more urgent to explain to the world the potential benefits of anaerobic digestion and biogas technology. 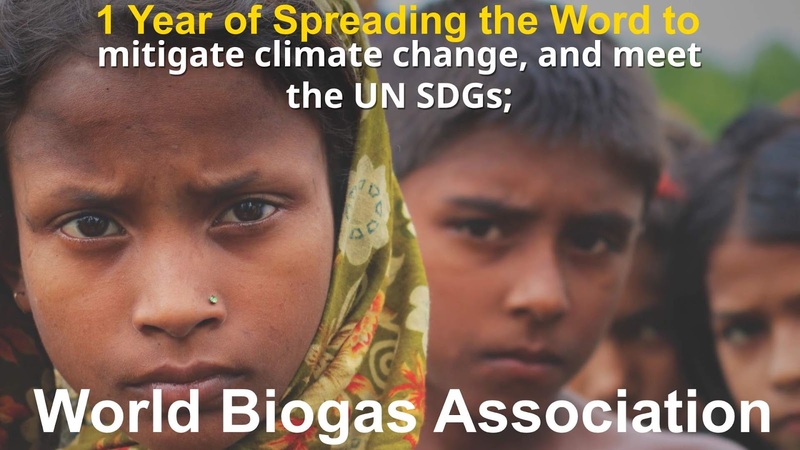 The World Biogas Association (WBA) is today celebrating its first year of achievements at the UN COP23 Climate Change Conference in Bonn as global leaders come together to review progress on reducing greenhouse gas emissions. The WBA was founded a year ago at COP22 in Marrakech with the aim of demonstrating the huge contribution that biogas can make to reducing emissions and supporting policymakers to create an environment that will encourage the development of biogas globally. Biogas, produced through reprocessing organic wastes and purpose-grown energy crops in anaerobic digestion plants, can be used to produce renewable heat and power, clean transport fuel, and nutrient-rich biofertiliser, and has the potential to reduce global greenhouse gas emissions by up to 20%. 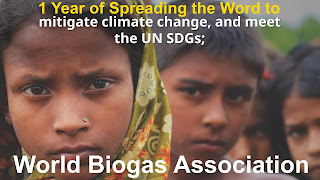 In its first year, the WBA has published: a report on the contribution of biogas to meeting the UN Sustainable Development Goals (SDGs); three factsheets on how biogas can improve urban air quality, mitigate climate change, and help meet the UN SDGs; and five reports on biogas markets in the US, Netherlands, Italy, Australia, and Poland respectively. The WBA is now working closely with the C40 Cities Climate Leadership Group on a report into increasing the uptake of separate food waste collections around the world and helping cities understand how biogas technologies can help them resolve issues around food waste. WBA President David Newman is speaking at an event at COP23 this Thursday (9th November) titled ‘Solving the nexus between waste, energy and agriculture – biogas technologies as a global solution’, which will examine how biogas can help to meet international climate goals and the UN SDGs. “It’s incredible to think that a whole year has already passed since we established the WBA at COP22 in Marrakech to be the voice for biogas around the world. We already have over 50 members from five different continents, and we’re growing all the time as those working in biogas across the planet look to the WBA to represent them at the highest political levels. “I’m delighted to be speaking here at COP23 to share the many benefits of biogas with politicians, policymakers, industry, and academics from all over the world. This crucial summit is the perfect precursor to our report with C40 on how cities can use biogas to resolve issues around food waste collection and treatment. Photo of WBA President David Newman attached for use. Or, for WBA publications click here. This is Issue 7 of IADAB News Weekly where we summarise the most important news of the week in the fast developing Anaerobic Digestion and Biogas Industry, both in the UK and globally. 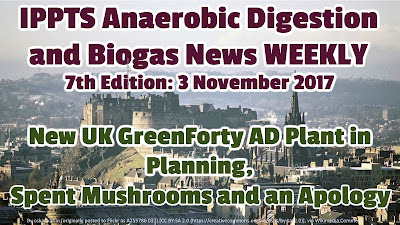 This week we report on a new UK GreenForty AD Plant which is now in Planning in Scotland, look briefly at some research which has given the green-light to using spent mushroom substrate as a biogas plant feedstock, and we also include the full details of an apology. The apology was issued by the UK's Anaerobic Digestion and Bioresources Association. ADBA appear to have been concerned that the Press Release which they published and we carried last week, was unintentionally capable of being read as criticism of individuals on a certain committee. Apparently, ABDA wish to make it clear that in-fact decision to delay was made by the whole government. The whole UK government, they say, was responsible for the decision to again delay the reinstatement of the Renewable Heat Incentive (RHI) for biogas plants. That new announcement about new AD Plants seem to be rare nowadays, probably does say something about depressed state of new biogas plants in the UK. Anaerobic digester plans have been submitted by GreenForty Development Limited. The company has submitted plans a facility which would use a variety of feedstocks – such as grass silage, hybrid rye, straw and vegetable processing residues – to produce renewable gas. “Brewery and distillery by-products will be procured and delivered as available." Once the biogas is produced, it would be ‘captured’; with most of it sent to a clean-up plant where it would be purified and upgraded before being put into the gas network. The next item is from academia which reports on research into the anaerobic digestion of an, as far as we are aware, novel biomass source. Spent mushroom substrate (SMS) is the residue of edible mushroom production occurring in huge amounts. The SMS residue can be digested for biogas production in the mesophilic anaerobic digestion. In the present study, performance of batch thermophilic anaerobic digestion (TAD) of SMS was investigated as well as the interconnected microbial population structure changes. In issue 6 of IADAB News Weekly we carried this Press Release. We are now compelled to re-publish it, in order to include the subsequent apology. The Chief Executive of the Anaerobic Digestion & Bioresources Association (ADBA) has described the government’s decision to further delay the tabling of legislation to support renewable heat generation as ‘a significant threat to the UK’s ability to meet its climate goals’. The Department for Business, Energy & Industrial Strategy (BEIS) confirmed at the end of last week that the tabling of legislation to reform the Renewable Heat Incentive (RHI), the government’s principal mechanism for incentivising the generation of renewable heat, will now not take place until the beginning of 2018. The legislation was originally due to be voted on in the spring of 2017 but was delayed after the government called a snap general election. It was then due to be introduced in the autumn, but has been delayed yet further due to the delay in re-establishing the Joint Committee on Statutory Instruments, a backlog in the legislative timetable following June’s general election, and a vast requirement for legislation related to Brexit. The proposed RHI legislation would restore tariffs for the production of renewable heat to previously higher levels, facilitating the construction of anaerobic digestion (AD) plants that can produce renewable biogas, which can be upgraded to biomethane for injection into the gas grid. Millions of pounds of investment in AD plants is currently on hold, waiting for clarity and certainty from government. ADBA also understands that BEIS is considering imposing restrictions on the amount of investment in renewable heat that can receive a guaranteed tariff rate. Some AD developers that have invested around £100,000 in reaching the stage where they can apply for a guarantee in reliance on the promised higher tariff rates may therefore face the prospect of missing out on government support entirely. "This further delay to the passing of the RHI legislation is another unnecessary blow to a vital industry that can make a large contribution to meeting the UK’s targets for decarbonising heat, to which the government has to date made very little progress. This delay not only puts millions of pounds of investment at risk but on a wider level is a significant threat to the UK’s ability to meet its climate change goals. I’ve written directly to ministers at BEIS urging them to rethink their decision to delay the legislation further and to reiterate the damaging effect that this further delay will have on the AD industry and its ability to help decarbonise the UK’s gas grid. We’re also very concerned at the suggestion from BEIS of new restrictions on the number of AD plants that can receive tariff guarantees. BEIS needs to ensure that it doesn’t punish AD for offering a clean and cost-effective way to heat our homes and businesses." [​Please note that ADBA’s press release dated 25/10/17 (‘Renewable heat legislation delay threatens climate goals – ADBA’) contained an unintentionally misleading statement. Charlotte Morton’s quote ‘I’ve written directly to ministers at BEIS urging them to rethink their decision to delay the legislation further’ is misleading as the decision to delay the RHI legislation would not have been one taken by BEIS ministers. To clarify, ADBA believes that the decision to delay the RHI legislation lays not with BEIS ministers but rather with the government as a whole, as the government is able to prioritise which pieces of legislation are tabled when.